JONAS Gutierrez is NOT yet fit enough to be considered for selection at Newcastle United, according to John Carver. Gutierrez yesterday said on Twitter that he was “ready” to return to Premier League action. The 31-year-old also claimed that it would be up to the club’s board as to whether he plays again for the club in the final few months of his contract. Head coach Carver, however, insisted after taking the job on until the end of the season that the club’s hierarchy has no input into team selection. 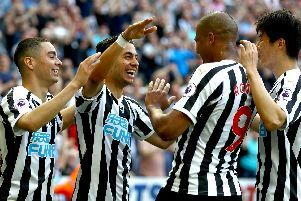 Gutierrez has played a number of Under-21 and behind-closed-doors games since returning to Tyneside in December after winning his battle against testicular cancer. He underwent a course of chemotherapy in his native Argentina last year. But Carver does not feel that Gutierrez – whose proposed move to Velez Sarsfield in his homeland broke down earlier this month – is quite ready to return to the field. “A little bit of it is in his hands,” said Carver. “He can play, but you know when you’re ready to go at Premier League level. I am waiting for the right time, and it’s not right at the moment. “I can see that on the training ground. He has come back from a serious situation, and I’m not putting any pressure on him. “I don’t know (if he will play for United again). I’d like to think so. It’s got to be right. Gutierrez has a clause in his contract entitling him to a new deal if he makes a certain number of appearances, understood to be eight, between now and the end of the season. Newcastle still have 12 games left this campaign. Many United fans would like to see the Argentina international, a popular figure because of his workrate and commitment to the cause, given an emotional send-off on the pitch. Asked if he could see such a scenario, Carver said: “At this moment in time, it’s too early to say that.